What a fantastic dinner! 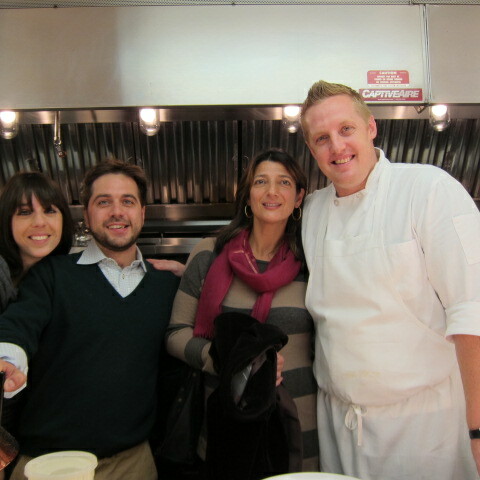 Left, Gustiamo (Nicolette, Stefano, Martina) with chef Jeremy McMillan at Bedford Post Inn, in Bedford, NY, north of the city. The place was jumping last Tuesday, a notoriusly slow night for restaurants. Bedford Post Inn is also an 8 room Relais & Chateaux AND it is owned by Richard Gere (need link? ), who often dines there. No, Richard was not in sight, but we really didn’t need any distractions from our meal! Incredible!!! Jeremy uses only fresh and the best ingredients (many from Gustiamo, provider of Italy’s Best Foods) and he is a young, very talented and passionate chef. When you go, try the tasting menu, so impressive I took it home – the paper version – to remember all the wonderful dishes we ate (some pictures, here). I need to mention the impeccable service (Oscar Henquet is the attentive manager) and the wines! Meng Chiang’s selection of wines perfectly matched the various dishes on the menu. The effect of the wine is clearly shown in this video, here. My voice altered by the alcohol. And no, I was not the driver on our way back home!!! Bravi tutti! Previous Post Identita’ Golose, The SCOOP! Esposito Chooses Danicoop! Next Post Gustiamo, Molto Batali’s Favorite Online Source!! !